Wednesday marked President Trump’s 300th day in office, but his administration remains in flux, with many key jobs still unfilled and a revolving door of nominees stumbling before they can be confirmed by the Senate. On Monday, Trump announced the nomination of former pharmaceutical executive Alex Azar to run the Health and Human Services Department. 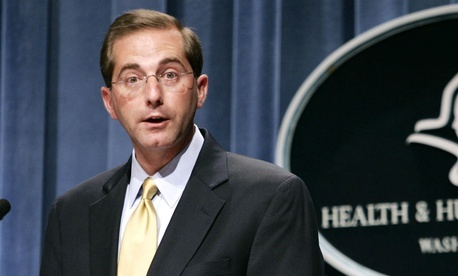 Azar served as deputy secretary of HHS during the George W. Bush administration.The pharmaceutical executive would be a replacement for former Secretary Tom Price, who was forced to resign after scrutiny over his use of private air travel at the government’s expense. Last week, Michigan state lawmaker Timothy Kelly withdrew his name from consideration to be assistant secretary of Education for career, technical and adult education, after offensive blog posts he wrote from 2009 to 2012 came to light. And the Senate narrowly confirmed Trump’s pick to be general counsel at the Transportation Department Tuesday night. Sens. John McCain, R-Ariz., and Rand Paul, R-Ky., both voted against Steven Bradbury, citing his role in the authorization of waterboarding and other forms of torture during the Bush administration, but he was confirmed by a 50-47 vote because Sens. Bob Menendez, D-N.J., Cory Booker, D-N.J., and Chris Van Hollen, D-Md., were not present. The Partnership for Public Service and The Washington Post have kept track of more than 600 positions requiring Senate confirmation. As of Wednesday, 255 key positions still have no nominee and only 184 nominees have been confirmed. By contrast, at this point in the Obama administration, 389 key positions had been confirmed by the Senate, and 435 appointees were confirmed by the 300th day of the George W. Bush administration. The Partnership’s data finds that while some agencies have seen significant action by the White House—83 percent of key positions at the Housing and Urban Development Department have nominees, 81 percent at Defense and 88 percent at Health and Human Services—less than half of those positions have confirmed appointees in place. The Labor, Education and Interior departments each have less than a quarter of key leaders in place, the Partnership said. Of 152 key positions at the State Department, only 77 people have been nominated, and the Senate has confirmed only 51 appointees. Wednesday marks the last day before the White House runs afoul of the Federal Vacancies Reform Act, which limits the time career officials can perform the duties of political appointees on an acting basis. The Partnership said leaving career feds in political roles too long can hurt the overall functioning of government, as well as hamper an administration’s ability to enact its agenda. Interior: Timothy Petty, assistant secretary for water and science. Petty is deputy legislative director for water, natural resources, the environment and other issues for Sen. James Risch, R-Idaho. He previously served as deputy assistant secretary of the Interior for water and science during the George W. Bush administration. Office of the Director of National Intelligence: Jason Klitenic, general counsel. Klitenic is a partner at a private sector law firm. He previously served as the first deputy general counsel of the Homeland Security Department, and as the deputy associate attorney general at the Justice Department. State: Robert Pence, ambassador to Finland. Pence is the founder and board chairman of The Pence Group, a development company.